These Victorian register covers are sand cast from solid white bronze, making them suitable to use in the floor, wall or ceiling. This heating air vent is equipped with a steel, adjustable damper which will diffuse hot and cold air flow. Our Victorian register covers are all handmade 1/4" thick here in the US to provide our customers with a quality product. The white bronze heating air vent is finished in a clear topcoat to prevent wear and tear from damaging the faceplate. Classic Grilles Victorian register covers are easily installed into your wall or ceiling with the screws provided. If the heating air vent is being used in the floor, select no screw holes to be drilled onto the register from the drop down menu below. Tip: All of the Victorian register covers are listed above according to the duct opening they will fit into. Do not measure an old vent to order. An 8 x 4 inch heating air vent will fit into an opening of that size and an additional 2 inches will be added for the outside border. Exact measurements can vary since each vent is handmade. Important: Your Victorian register covers are hand-made an your order can take between 7 to 9 weeks to ship out. These heating air vents made by Classic Grilles are considered non-returnable, special order items which cannot be canceled once an order has been placed. Purchase Victorian register covers without the damper to have a classic return air vent with a screen backing. 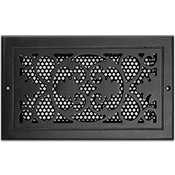 Other heating air vent cover designs can be found in our Classic Grille Registers section. Order your Victorian register covers and restyle your home to match your personal style! Call us today.